KG Hypnobirthing is a complete antenatal course, which will prepare you for birth and parenthood, allowing you to have the best natural birth for you. The KG Hypnobirthing Teacher Training course is accredited by the Royal College of Midwives and is the preferred teaching school for midwives across the UK. Hypnobirthing will also provide you with the knowledge and advice needed to understand your body, teaching you how to release fear and build your confidence, make decisions around your body and babies birth. The practice of positive affirmation, relaxation and breathing technique are also used and undeniably allows you to remain in a space of peace and calm so you can aim for a more comfortable birth; which is not only good for you but good for baby. You can experience hypnobirthing classes on your own or with a partner either way it really is very empowering and nurturing experience. Some people view hypnotherapy as a way to make people behave strangely e.g. bark like a dog or cluck like a chicken. This is part of stage hypnosis. The word hypnotherapy is really the use of words used in a more positive and focused manner to helps people release some of the negative ideas we may have formed as we progress through life; of course we have plenty of positive thoughts too but words are truly powerful and used in the right or wrong way can take on a different meaning. Hypnobirthing is firstly building your ability to relax, the preferred state to be in during labour. Helping you release fear around labour and birth, building your confidence to work with your body intuitively, also uses the more traditional part of hypnotherapy. Hypnobirthing helps you to have a positive birthing experience. 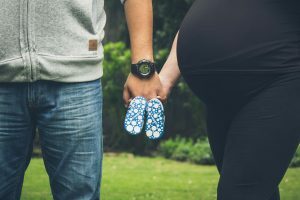 The making of a baby is a partnership, the bringing up of the child is a partnership and hypnobirthing fosters partnership during the pregnancy and birth. Hypnobirthing babies are often calmer babies. Expectant parents can attend a hypnobirthing course at any time yet we find parents tend to enrol on their hypnobirthing course just after their 20-week scan. Most couples tend to start between 26-33 weeks. The earlier you learn these range of tools and techniques the more time you will have to practice and enjoy this positively, empowering experience. Remember, it is never too late in pregnancy to learn and effectively use hypnobirthing techniques for a gentle birth experience. Dads, you’ll be amazed just how much you learn from a hypnobirthing course and how well it’ll prepare you for your role in the birth of your baby. We highly recommend you attend the course with your partner/birth companion, however expectant mums who attend all or part of the course on their own can equally benefit from hypnobirthing. Reiki Babies currently run personal hypnobirthing tuition in the comfort of your own home, we will be organising group courses very soon, to register your interest please email info@reikibabies.co.uk. Group classes now running, please visit our diary of events for dates and further details. Nurturing email/phone support from booking, up to and following the birth of your baby. For 2 or more couples please contact us to arrange your course at a discounted rate. For more information and to book your Reiki Babies KG Hypnobirthing course please email us at info@reikibabies.co.uk or call us on 07557 923201.